Sometimes, you will be required to share large files from one iOS device to another, or from iPhone to an Android or Windows device. It’s very easy to transfer files between iOS device since there’s a powerful features AirDrop exclusively for iOS users. However, if you want to send files to other platform from iPhone or iPad, the chances of direct transfer is bleak. You can’t easily perform cross-platform file transfer and sharing while using iOS device. Even though iPhone provides support for Bluetooth, you will find it difficult to pair with Android devices, not to mention sharing large files via it. In this case, you would better take advantage of Wi-Fi to transfer large sized files such as images, videos, documents and presentations from iPhone to others. It is to be noted that file transfering via Wi-Fi is faster than Bluetooth. Hence you could make use of various file sharing apps in App Store, which can be used to perform cross-platform file sharing via Wi-Fi. In this article, we will provide a list of five best file transfer apps for iPhone in 2019. 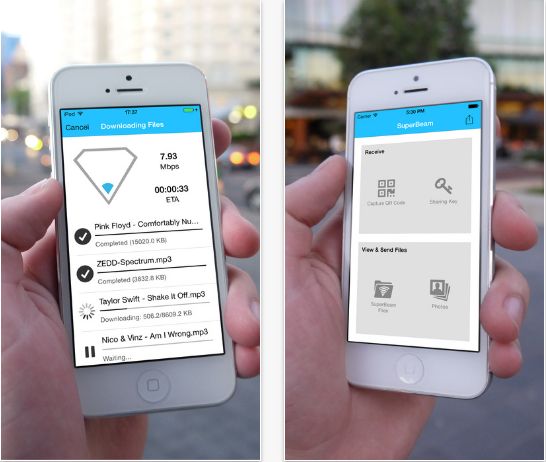 With SuperBeam Lite, you will be able to share large files easily via Wi-Fi from iPhone. You can pair your iPhone with the targeted devices using either QR code or manual sharing of keys. It is possible to share single or multiple files in one time such as images, videos and other files. It is advisable to make use of the port 8080 for all types of transmissions, which means enhanced compatibility on restricted Wi-Fi networks. You need not worry about duplicate files because SuperBeam will automatically add unique numbers to duplicated file names. If you would like get rid of the advertisements, you can purchase the Pro version. 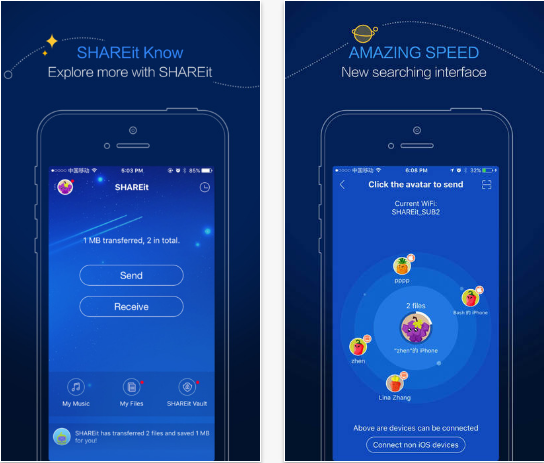 SHAREit is a popular transfer tool in Apple App Store, which helps you to share files from iPhone without incurring any mobile data and is over 200 times faster than Bluetooth technology. With this app, you can share images, videos, audio files from your iPhone orto other places like computer. The SHAREit app is capable of transferring a film within 10 seconds and the speed can exceed 20Mb/s. You can enjoy music with the help of the SHAREit music player. 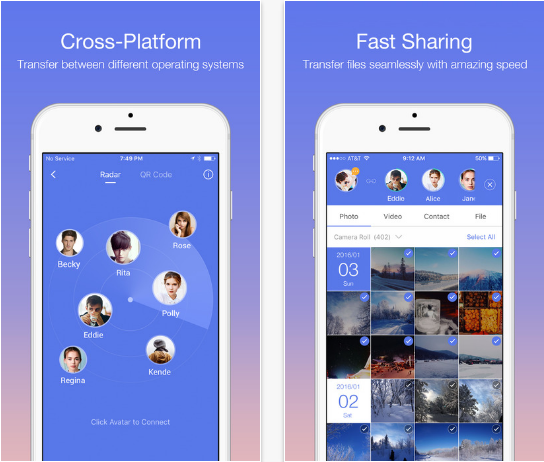 The SHAREit Vault is an integrated encryption module, which helps you to share images and videos from iPhone safely. Moreover, the app helps you to protect privacy to a large extent. You can transfer files between laptops and mobiles without any lags. The app provides support for a wide range of files. 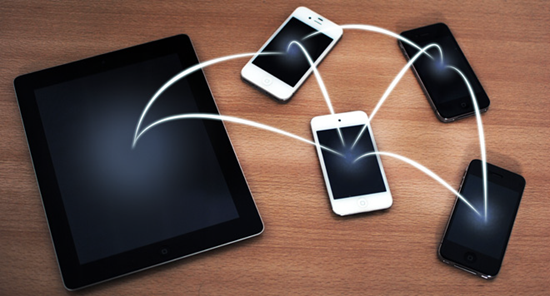 You don’t need any cables or Internet to transfer files and can easily share between several devices. Zapya enables you to transfer files from iPhone to several devices. The Zapya provides support for multiple languages and you can share files between devices without cables. It is possible to transfer files irrespective of file formats. The app is capable of transferring files between devices with up to 10MB/second. 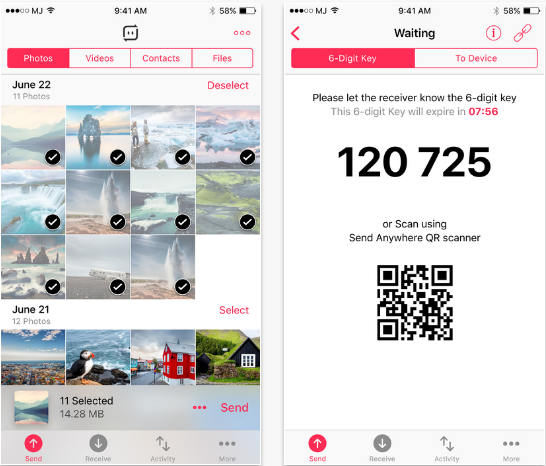 You can transfer up to 260 pictures within one minute without using mobile data from iPhone. It makes use of MultiPeer AirDrop connectivity framework that enables file sharing among iOS and Mac gadgets. It is also possible to manage camera of the connected device with peer permission to generate customized QR code. The integrated GPS connectivity helps you to find nearby devices easily. You can protect important files and make use of the phone replicate function. With Send Anywhere, you can send images and videos in original size from iPhone to your laptop or PC including the ability to share them with friends. You need not login and register for the purpose of sharing. It is possible to configure 6-digit key to send and receive files. Also it can generate share link, which will be valid for 48 hours. The app will also sends a notification to your iPhone that enables you to receive files without providing a key. The Send Anywhere app provides support for multi-language subtitles. You can also play music files with the help of the integrated music player on iPhone freely. 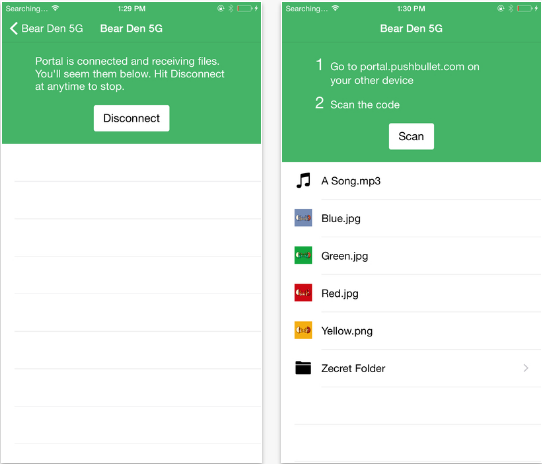 With the help of the Portal app, you can transfer single and multiple files from iPhone easily. It is also possible to transfer entire folder in bulk. You can perform unlimited data transfer without registration. The app is designed in such a way that the files are moved quickly between devices. The Portal app is capable of automatically saving transferred images inside your Photos app. If you have any suggestion or question, feel free to leave a comment below.